The Fed’s quantitative easing program is relatively plain vanilla compared to what other central banks are doing. That’s a remarkable statement as expanding its balance sheet is a new phenomenon. If you would have discussed the idea of the Fed’s balance sheet being $4.5 trillion, filled with treasuries and mortgage debt, with investors 10 years ago, most would have thought you were insane. Now the Fed is normal compared to the others as the Bank of Japan is buying ETFs and the Swiss Central Bank is buying stocks, some being America’s top technology firms. The ECB released the details of its veiled procedures after the European Parliament criticized it for lacking transparency. There would have been more detractors if the details were described beforehand. It sounds like when Nancy Pelosi said, “we have to pass the bill so that you can find out what is in it” regarding Obamacare. In this case the ECB had to buy hundreds of billions of euros in corporate bonds before we found out what they were purchasing and what the effects would be. To be clear, the ECB wouldn’t have been able to predict the effects beforehand, which lends credence to the argument that it shouldn’t have done this. For American’s reading this article, this affects US markets as well because the ECB bought some corporate debt in American firms as you will see. Before we get into the details of the program, there are two terms you must know. The CSPP is the Corporate Sector Purchase Program. The AAP is the Asset Purchase Program. As you may be able to tell, the AAP had been in place first. The CSPP is an extension of the AAP. As of June 7th, 2017, the CSPP was 92 billion euros. The ECB has purchased 11% of the potential bonds it could buy based on what it considers eligible. 12% of the bond purchases had negative yields. This shows how the negative yields are being artificially created by the ECB. In truly free markets negative yields would be unfathomable. You loaning money from me, and me paying you interest for the right to loan you money is not how economics works. In a normal situation without these purchases, it would be unlikely for investors to buy negative yielding bonds unless the economy was in deep deflation. The current environment is one of low inflation which means investors who are buying negative yielding bonds are piggybacking off the ECB. They buy the bonds expecting prices to go higher and yields to go lower as the ECB continues the program. These negative yielding bonds would plummet in value and their yields would rise to fair market values if the ECB reversed this program. There aren’t negative yielding corporate bond yields in America which has more of a free market because the Fed isn’t buying corporate bonds, yet. 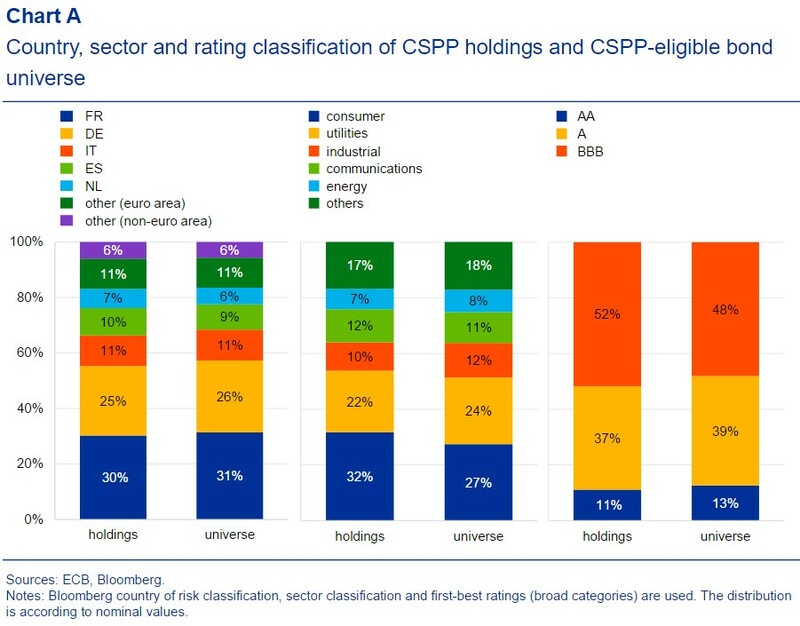 The chart below breaks down the purchases by country, sector, and credit rating. 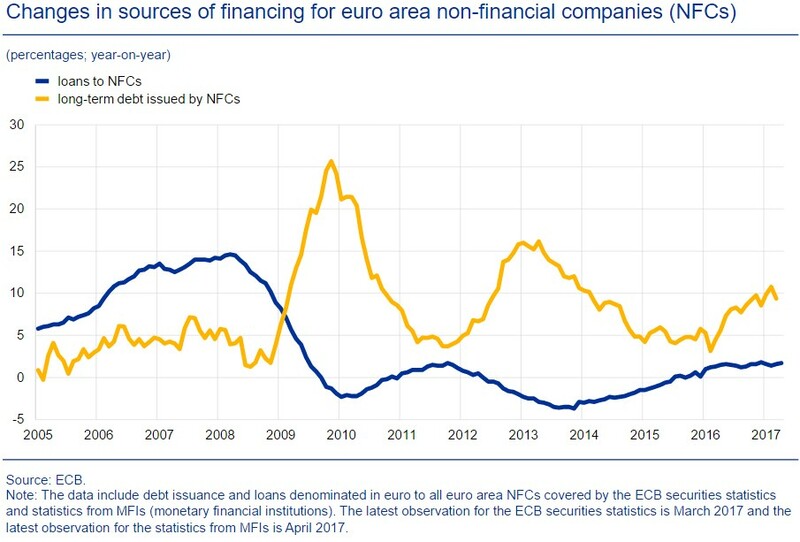 The point of this chart is to show you that the ECB doesn’t have preferences with its purchases. This was probably an area of concern for the European Parliament. In theory, a rogue ECB could decide to buy more corporate bonds from a particular country or industry to help them. That would be cronyism. 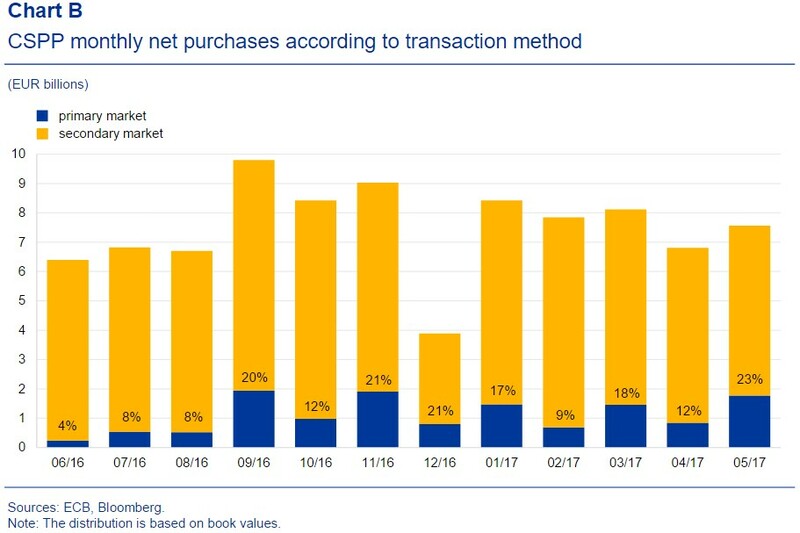 It’s ironic how the ECB claims to want to not affect the market with its purchases because the very act of purchasing bonds has dramatic consequences. It is propping up businesses, some of which may not exist, if it wasn’t for these purchases making it cheaper to get credit. Propping up businesses creates a zombie economy as firms are no longer beholden to making the best decisions that deliver the greatest value to customers, such as spending capex. If credit is cheap, why risk capital innovating when you can buy back stock? This eliminates the incentive structure capitalism needs to thrive. This lowers innovation as bad businesses are propped up. Capitalism is a system of creative destruction. The failures need to get out of the way for the successful businesses to thrive. As was mentioned earlier, the ECB has purchased corporate bonds from American firms. The chart below uses the information provided by UBS to show which American firms the ECB owns bonds in. The ECB buying those firms’ bonds gives them an unfair advantage. Caterpillar gets to borrow at a cheaper rate than its manufacturing competitors whose bonds weren’t purchased by the ECB. This distorts the market. Caterpillar is less responsible to the marketplace than it has been throughout its history. These purchases generally help larger firms at the expense of small firms whose bonds are too small for the ECB to consider. This distortion between funding for large and small companies, increases bankruptcy risk for small business, or a takeover by a large company who can issue debt cheaply. Less competition, higher prices, less choices for consumers – not good for economic growth. The chart below differentiates between bonds purchased in the secondary market and those purchased from the primary market which is directly from the company. 15% of the bonds purchased were directly from companies. The ECB is one step away from giving money to random people in the streets and telling them to go start a business. Bond purchases had similar effects, namely the yields fell after they were purchased. The first black line is when the plan was announced and the second black line was when the buying started. If you were to draw a third black line for when the ECB were to announce the ending of this program, yields would increase. There would be firms going bankrupt if the ECB stopped buying bonds as all the firms living off cheap debt would have to survive in the free market on their own. 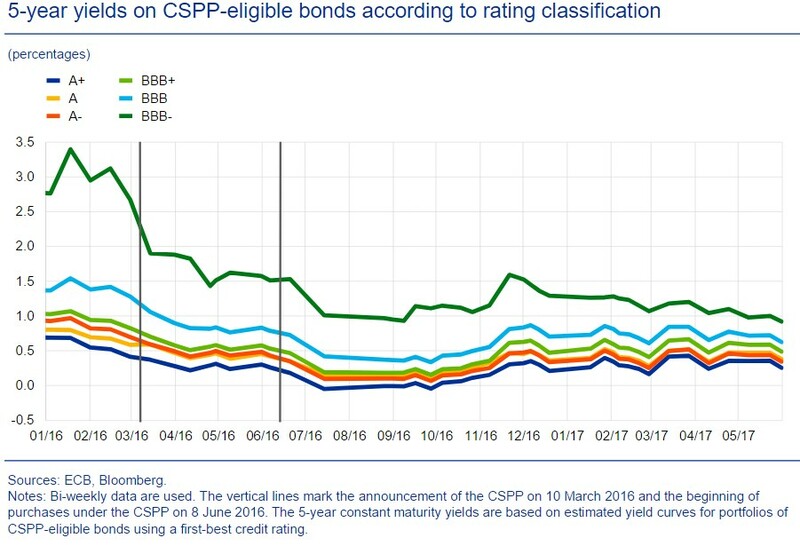 Term premium wasn’t affected because it still makes sense to give a premium to longer maturity bonds. 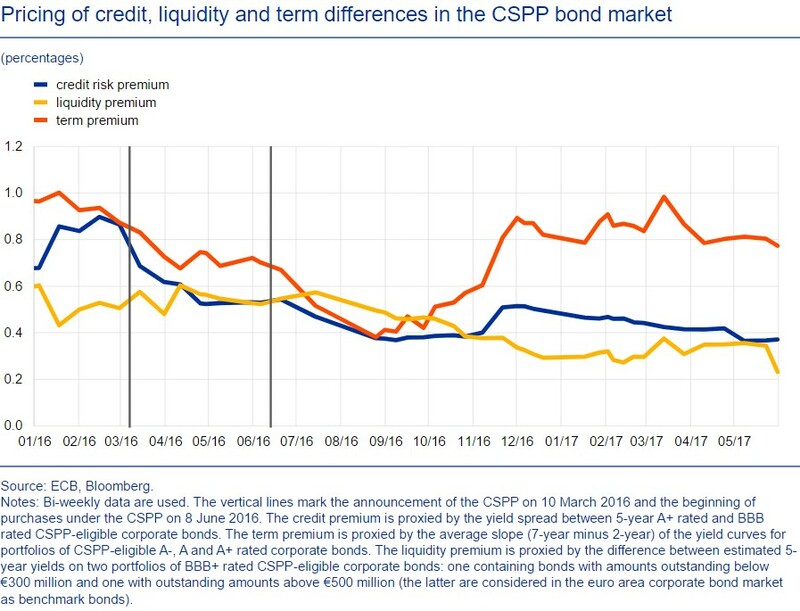 On the other hand, credit risk has fallen because there’s small risk of a firm going bankrupt if there’s endless free currency printed by the ECB and given to firms. The liquidity premium also fell as the ECB’s purchases add liquidity to the system. The final chart shows the changes in long-term debt issuances by non-financial corporations. The growth rate of bonds issued was 10% from the spring 2016 when the program started until the beginning of 2017. The other increases in the debt issuances were caused by declines in bank lending. Now debt and lending are increasing which is why the financial conditions are very favorable. The ECB is manipulating the private sector by propping up weak businesses. Without the creative destruction of capitalism, the private sector will be saddled with more debt and less growth. This combined with an aging population is a toxic combination for Europe and the United States. NextAre Stocks & Bonds Signaling A Weak Or Strong Economy?